Inspired by the Light and Space Movement of the 1960s and 1970s, which focused on perceptual phenomena through the use of light and reflective materials, this project began as exploration of materiality in my independent study with Professor David Comberg. I was interested in the interaction of light with form in a space to create a sense of intimacy between the viewer and the work. James Turrell’s installations, in particular, “celebrate the optical and emotional effects of luminosity.” His work provokes spectators to become aware of the function of our own senses and of light as a tangible substance. Upon visiting his Skyspace installation “Greet the Light”, I was especially inspired by the awareness it brought about in me regarding my sight and perception. This materiality influenced my ruminations on color theory and on subjective experiences that can be formed in a space. 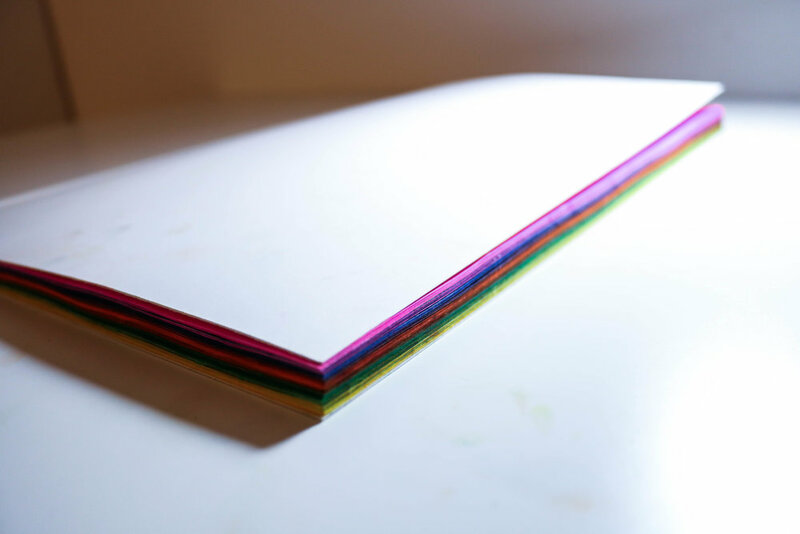 My work, at its core, is a book that includes no text or images, but rather textures from colored ink printed on pages. While traditional books rely on a storyline to form a narrative, this book guides the viewers through the deliberate arrangement of colored spreads that contain subtle textures. The mental and emotional reactions evoked by light falling on a surface differ from person to person, so the experience of interacting with this book is unpredictable and individual. Some may find this environment meditative, while others may find it invigorating. How the book was left by the previous visitor—whether it was open to a particular color or closed—will also play a role in the next visitor’s experience. When creating the space, I considered the look and feel of the desk, chair, and lamp as to not detract from the presence of the book and instead offer an intimate, familiar space in which this immersive experience can occur. The live feed to the monitor outside of the room serves as an alternate way of experiencing the book. The video displays the motion of the visitor’s hand turning the pages in real time, creating a sensuous abstraction of the work, displaced from its original place. This project allowed me to explore form, materials, and sensory phenomena to create a more interactive, experiential installation.